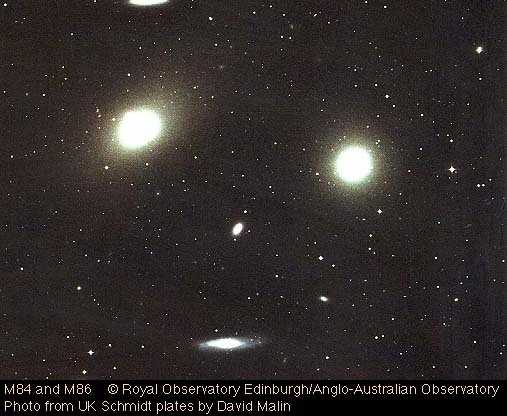 The M84/M86 Region in the Virgo cluster as photographed with the 4-meter Mayall Telescope of Kitt peak National Observatory. 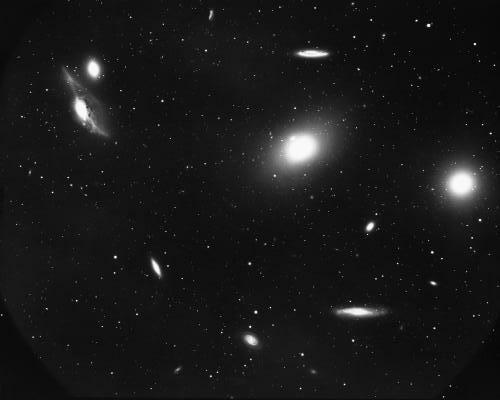 This image was taken in 1974; many fainter galaxies are seen between bright M86 (near center) and M84 (on the right), both either elliptical or lenticular galaxies. In this longer exposure with a more powerful instrument, nearly exactly the same field is photographed as in our main image for M84, but rotated 180 degrees. The higher sensitivity for faint light reveals that the galaxies are much larger, and thus much denser packed in this huge agglomeration. 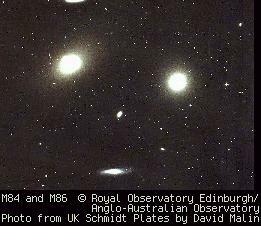 Apparently, the faint outer halos of M84 and M86 come very close in this image (they even seem to touch in the older scan of this UKS image), and the fainter galaxies have grown to considerable size and reveal impressive detail. The real extent of the fainter envelopes of these galaxies is even more impressive on deep images (long exposures on sensitive film). This image is copyrighted and may be used for private purpose only. For any other kind of use, including internet mirroring and storing on CD-ROM, please contact the Photo Permissions Department (photo at aaoepp.aao.gov.au) of the Anglo Australian Observatory.